On Nov. 10, Go Wichita and its community partners showed preliminary data from more than 2,000 respondents about the future of Wichita's brand. 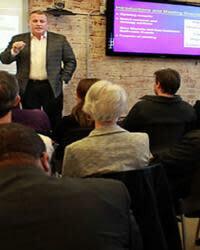 Nearly 60 people gathered at Wichita Downtown Development Corporation's Innovation Center to hear key trends that immerged as a part of the process. Data from 1,999 survey respondents and 200 interviews showed the Keeper of the Plains, Sedgwick County Zoo and Old Town District ranked highest among the city's many functional attributes. People also ranked the city favorably for being family-oriented, affordable and hospitable. The data showed that residents were more critical of the community than visitors and there is low awareness of the city as a unique destination, which creates an opportunity for Go Wichita to highlight the city's many attractions. The project is not a logo, slogan or tagline and was created to establish a strategy to deliver Wichita's unique brand process. It has been made possible thanks to a partnership between Go Wichita, Wichita Metro Chamber of Commerce, Greater Wichita Economic Development Coalition, Wichita Downtown Development Corporation, Wichita Community Foundation and Wichita State University. After a complete analysis of the information and the community's brand strategy has been established, a final brand blueprint will be created. The process should be complete by the end of the year.